The third chapter in the latest incarnation of the venerable monkey-movie series, War for the Planet of the Apes follows last week’s Spider-Man: Homecoming as an example of how to allow a franchise to continue to expand and breathe rather than trying to keep it mired in by-the-numbers numbness. While it doesn’t quite match its immediate predecessor, 2014’s masterful Dawn of the Planet of the Apes, this latest entry admirably opts to forge its own path rather than slavishly cut and paste past formulas. While the series opener, 2011’s Rise of the Planet of the Apes, spent slightly more time on the humans and Dawn divided its focus equally between humans and apes, War almost completely adopts the point of view of the simians. At its center, of course, is Caesar (a motion-captured Andy Serkis), who doesn’t actively seek conflict but instead wants apes to be left alone. 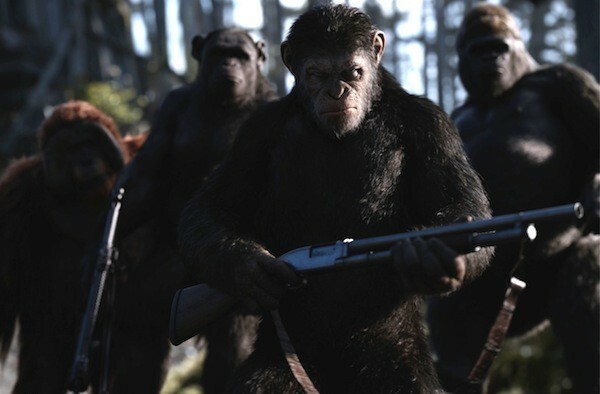 Unfortunately, the members of a nearby military outfit don’t share Caesar’s separatist policy – led by an imposing figure known only as The Colonel (Woody Harrelson), they seek to completely obliterate all apes. Harrelson is generally employed in roles that provide plenty of opportunities for sarcastic asides (The Hunger Games, The Edge of Seventeen, etc. ), so it’s almost startling to see him tackling a character as savage and single-minded as the one he essays here. The Colonel may be utterly venal, but there’s a method to his madness, and while it never really makes him sympathetic, it does add some interesting shadings to the part. Serkis again excels in the role that arguably will surpass Gollum as his most iconic, and while I could have used a bit less of Bad Ape (Steve Zahn), a lonely and simple-minded simian, writer-director Matt Reeves and co-scripter Mark Bomback are nevertheless careful to avoid turning him into merely a one-note figure who pops up at regular intervals to offer strained comic relief. Instead, War for the Planet of the Apes remains rigidly dank and dour – for those seeking mirthful monkeyshines, there’s always Clint’s pal Clyde.